We, Nashville Friends Meeting (Quakers), would like to extend to you our utmost regard and support for your non-violent struggle to stop the construction of the naval base on your island. We hold all of you in God’s Light and are deeply saddened by so much needless destruction of precious natural and cultural resources and by the spirit of violence that lies beneath that destruction. We add our prayers and voices to yours for the permanent halt to the construction of the naval base. Please note the attached letter which we have sent to the President of the United States, a similar one is also being sent to your President in South Korea. President of the United States of America 530 26th Ave. N.
We, the Nashville Friends Meeting (Quakers), are writing to you at this time to urge your intervention to stop the construction of a naval base at Gangjeong Village on Jeju Island, South Korea. As we are sure you are aware, in 2005 Jeju Island was designated as an Island of Peace, and has been appointed as a Biosphere Reserve, World Heritage Site, and Global Geological Park by UNESCO. The residents of Gangjeong Village have been organizing nonviolent protest to stop the construction of a massive naval base which will destroy their community, way of life, and rich marine ecosystem which women sea divers, fisherman and farmers depend on for their livelihoods. 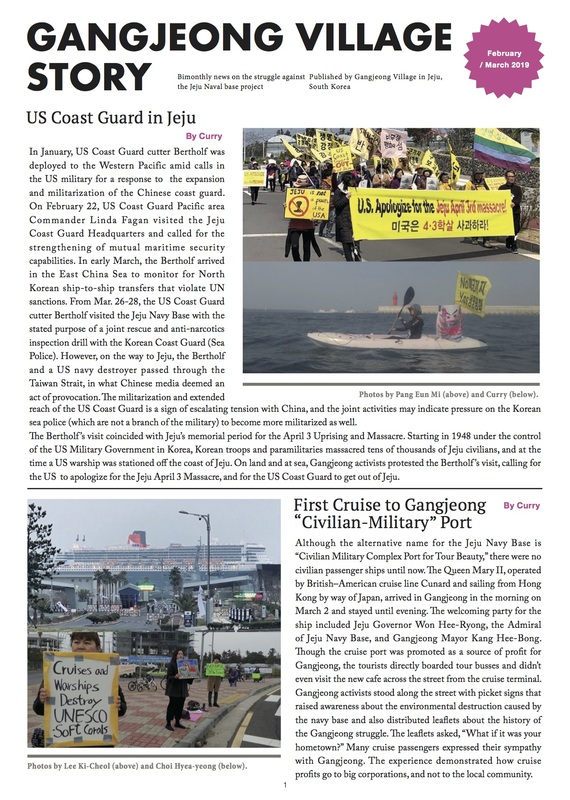 In our discernment of this issue, we have found that although the United States of America has maintained operational control over the military of South Korea since the beginning of the Korean War, your administration denies responsibility for the decision to construct the naval base on Jeju Island. We believe that it is unacceptable for the government of the United States of America to sustain an official stance of non-intervention in this matter while it effectively maintains operational control over the military in South Korea. Nashville Friends Meeting supports the non-violent protest of the residents of Gangjeong Village. The construction of this naval base is anti-democratic, flies in the face of the spirit of the island’s identification as an “Island of Peace”, and threatens its UNESCO designations. The lack of transparency by both the United States and the South Korean governments in this matter is unacceptable. Equally unacceptable are the numerous violations of basic human rights by the South Korean government, with tacit approval of the United States, in the suppression of nonviolent protests by the people of Gangjeong. We urge you, Mr. President, to take personal responsibility and stop the construction of the naval base on Jeju Island. Thank you for your diligent attention to our concern.